Wir haben den Mulcher jetzt ca. 3 Monate und haben noch nicht viel damit gemacht. Wir haben ein paar Gräben und ein paar Wegränder gemulcht. Mit derArbeit des Gerätes sind wir sehr zufrieden. Das Preisleistungsverhältnis Stimmt unserer Ansicht nach. Aber man sollte die Montageanleitung des Gerätes etwas anpassen. Der Zusammenbau war komplizierter als es die Anleitung beschrieb. So mussten viele Arbeiten durchgeführt werden, welche nicht in der Anleitung beschrieben waren. Wir würden die Maschine nach dem jetzigen Stand, aber auf jeden Fall wieder kaufen. The especially robust construction of the AGF-180 verge mulching mower makes it stand out. In contrast to the lighter models AGL-180, AGL-185, etc., this is the heaviest mowing unit model (higher material strength etc.) we are dealing with. Heavier 1.2 kg hammers are also installed in this mowing unit, not the otherwise standard 800 g hammers. 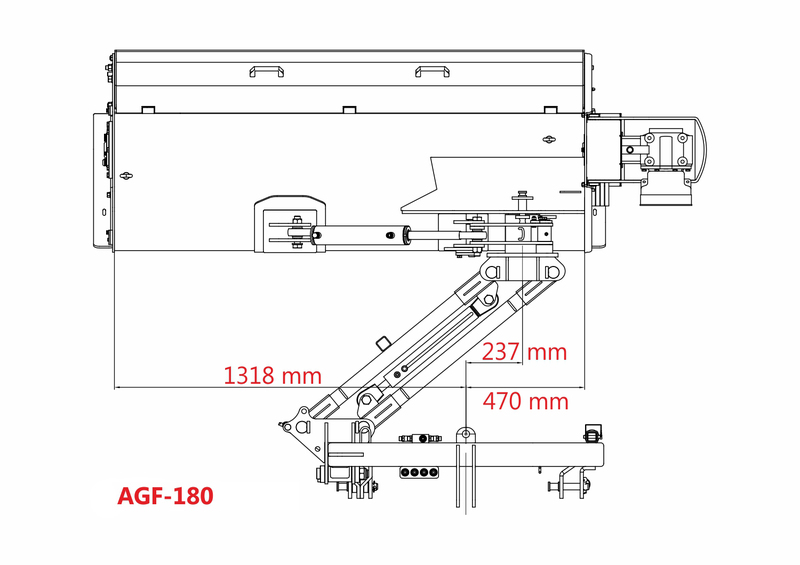 The Jansen AGF-180 has a specially strengthened angular gearbox. Through lateral alignment of the mowing unit, you can mow ditches, bank areas, earth walls, etc., with ease. This model has a mowing width of 178 cm and is driven using a P.T.O, included as part of the delivery. It can be moved to the left and right and you can set it at an angle (90° upward and 55° downward). 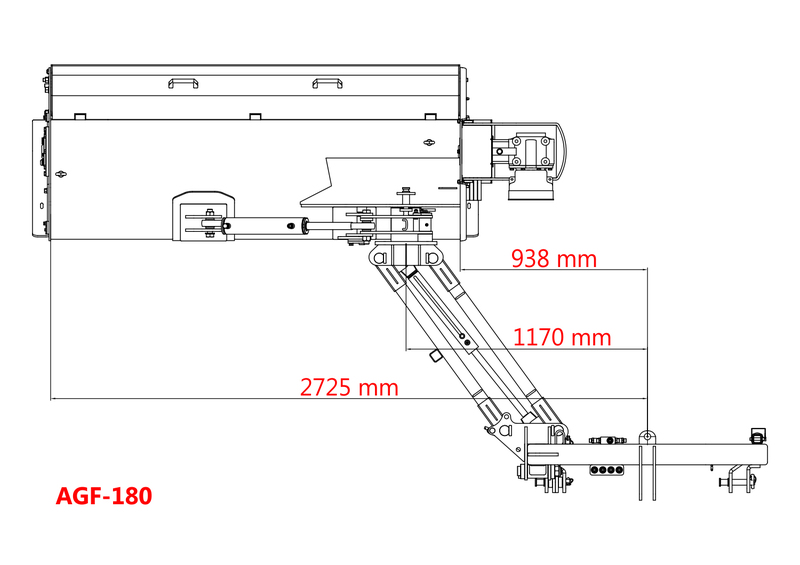 For this function you need 2 hydraulic control circuits on your tractor, as the mower unit has 2 double-action hydraulic cylinders for this purpose. Furthermore, the Jansen AGF-180 comes with collision protection. This is triggered in the event of contact with hindrances, for example fencepost etc., and allows the verge mulching mower unit to swing upward in order to minimise the risk of greater damage. The AGF-180 mulching mower additionally has a trailing roller and a freewheel gearbox. The suspended, galvanised slats at the front of the mower unit prevent stones escaping. The cutting height can be set with the top controller and the runners mounted on the side. The mower unit is hung using the three point linkage of your tractor (from Cat. II). Your tractor should have at least 60 HP. In the event of questions or problems we are also only a phone call away do help you personally. With us you speak with knowledgeable staff and not with “call-centre agents”!